The Illinois Council for the Social Studies (ICSS) was founded in 1938 in order to improve social studies teaching, to develop the professional interests of social studies instructors, and to cooperate with other organizations working for a better social understanding in the state, nation, and world. ICSS provides professional development opportunities, publications, and service to Illinois teachers. 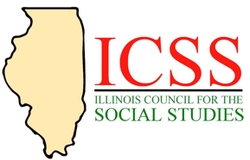 As an affiliate of the National Council for the Social Studies, ICSS is the professional organization for social educators in Illinois. Please browse the pages on this site to learn more about membership, our upcoming conferences, and the NCSS. Follow us on FaceBook, Pinterest, YouTube, and Twitter by clicking on the icons at the bottom of the page! Contact members of the ICSS Board of Directors for more information.